Here are this week’s Sunday Sevens as organised by Nat at Threads & Bobbins – seven photos that sum up your week that otherwise wouldn’t be enough to make a full blog post. No.1 Son graduated from Plymouth University with a 2.1 in Business Studies. He’s already got his first post-degree position in Marketing. Here he is with his sister. 2. 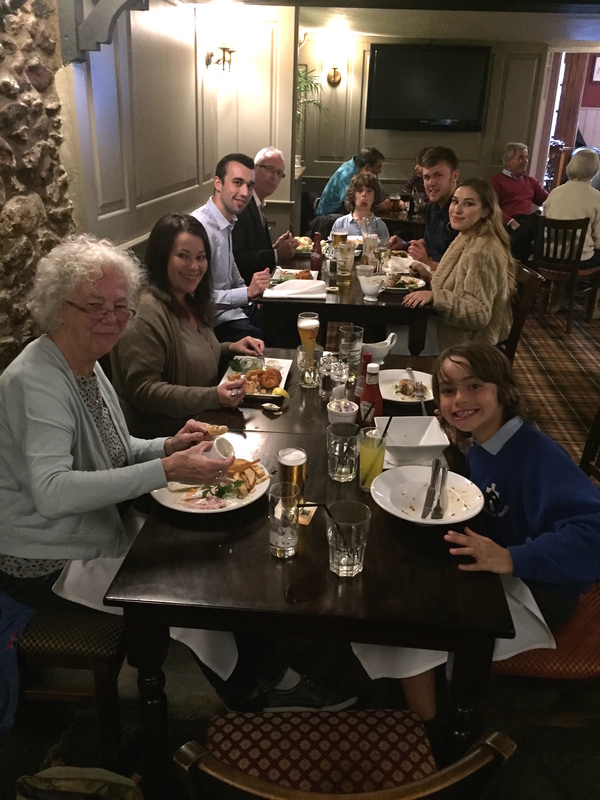 Celebratory post ceremony meal back at our local pub. 3. Work continues at the weekends on the sun room. 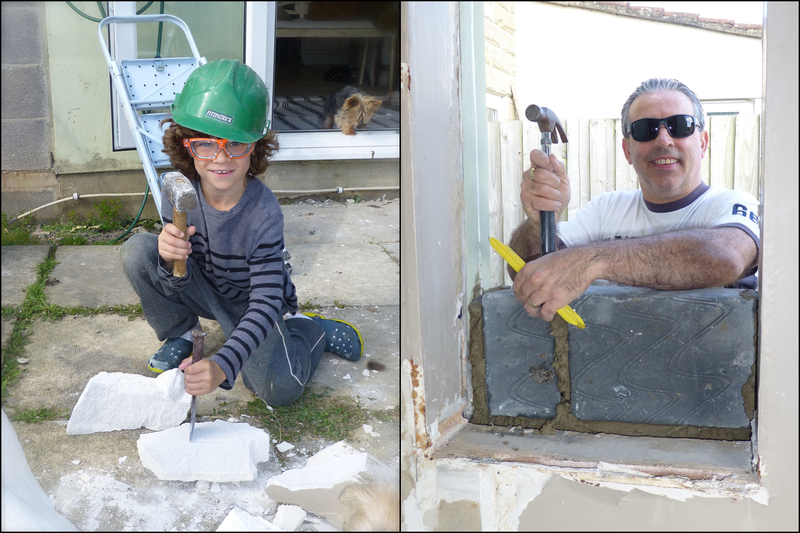 No.3 Son is helping daddy build…. 4. 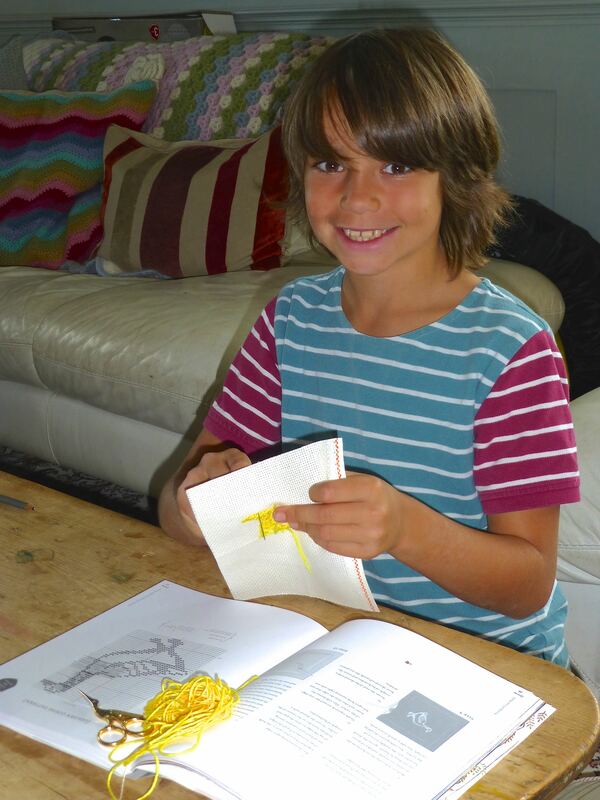 …..whilst No.2 Son does cross stitch with mummy! 5. 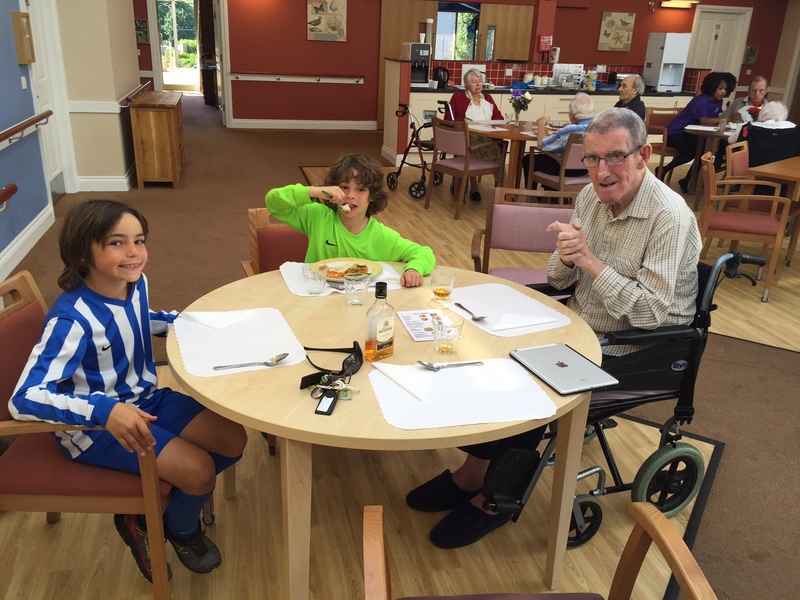 Lunch with Granddad in his care home. The Boys didn’t drink the whisky. 6. 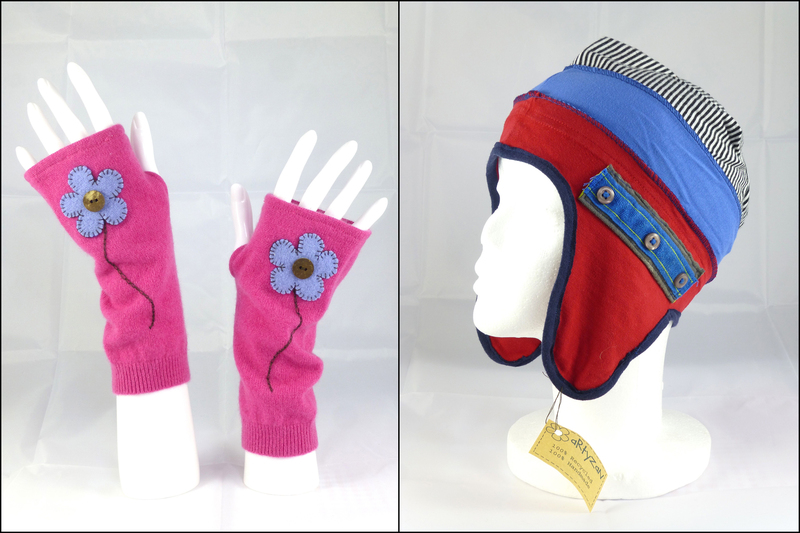 Stocking up my other Folksy shop, ‘Artyzan Crafts’, which sells accessories made from upcyled materials only. 7. My exciting new venture – I’ve opened a sewing school! After a LOT of planning the first courses are starting after half term. Website is done but not all sections are completed yet. If you fancy a nose, click on the pictures or follow this link – The Stitch Academy. Well, a stitching school really, as I plan to offer knitting and crochet tuition too. Congrats to Number One Son! Great week of photos of your lovely family, and how wonderful that you are offering sewing to both girls and boys. Back in the not-always-so-good old days, nobody would have considered that. I remember the only boy in school who used to knit in the 70s and my two youngest boys crochet and sew, so it made sense. It’s acceptable nowadays and fathers don’t baulk at the idea, so why not? A sewing school – that’s fantastic! How exciting – all the very best for a successful new venture. I could see images when I looked! All the best for your fab new project, great idea. 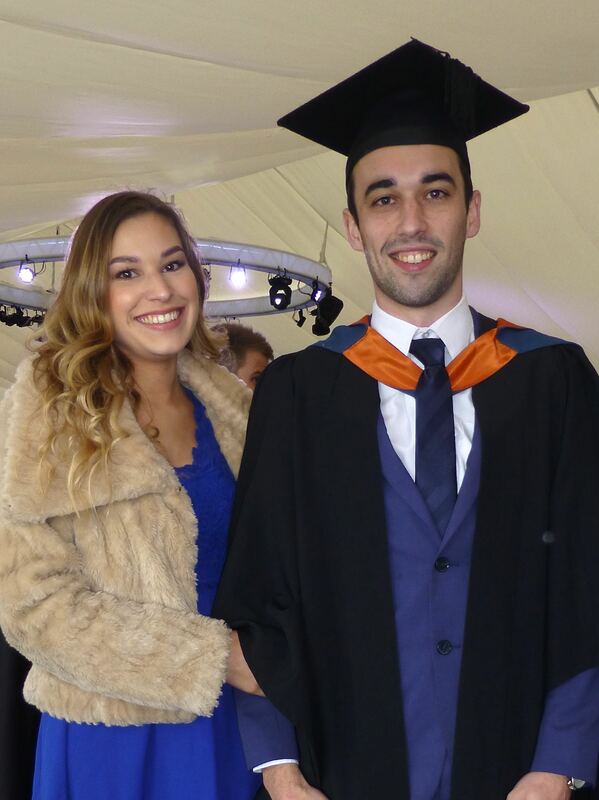 Congrats to No 1 son on his graduation, you must be a very proud Mama. What a fantastic week you’ve had! You must be very proud of your children and yourself. You look fab, and I bet strangers think you’re sisters (no I’m not sucking up!!). I’d love to have a sewing cafe but it’ll have to wait until the mortgage is paid off! Congratulations on opening your sewing school. It’s a dream of mine too. Good luck and I will be following along. Maybe it will be the nudge I need to take the leap. Thank you! My ultimate dream is to run a B+B with residential sewing courses, but this comes a close second. I’m running classes from the kitchen table (it’s huge) at the moment but, if it goes well, we’ll put a log cabin in the garden and run the school from there. Congratulations to your son – you must be a very proud mum. And wow a stitching school – good on you. Good luck – may it flourish! 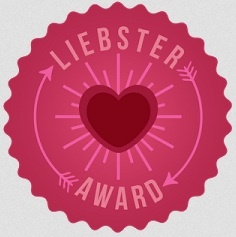 Thank you – I am very proud, he’s worked so hard and deserves it. A job within three months of finishing Uni, too. That doesn’t often happen nowadays. The flyers and posters for the sewing sewing school are being printed today and I’ve already got some students lined up just from chatting to mums in the playground – I can’t quite believe it’s actually happening! What an exciting week! Best of luck on the sewing school and congrats to your son on his accomplishment! Thanks T, it’s all a bit of a whirl at the moment, but exciting times ahead! If I live near you, I would attend your school for sure! I think you’re doing pretty well by yourself and will probably be teaching sewing alongside your sock knitting classes before very long!! 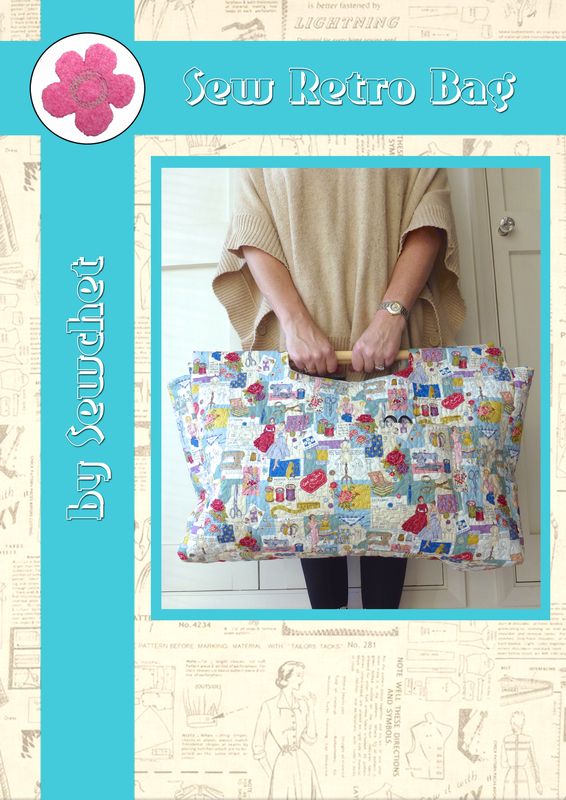 Thanks Beth – to be honest, seeing you running sewing classes spurred me on no end and I can’t wait to get started. Leaflets are being printed today and chatting in the playground has already led to several mums wanting their kids to join. Aw wow. I know if I can do it you certainly can!! It was a crazy week, but thank you for your comments! I ‘ve got to bite the bullet and order four more sewing machines next – ouch! What gorgeous offspring you have. Congratulations to no 1 son. And huge congratulations on the the new venture. I’m sure it will be a great success. Congratulations on your new adventure! Wow a sewing school! You must be really excited about it. It is nice that you have classes for kids, too! Better to start them early, right? And aww, isn’t it sweet that your son spends time cross-stitching with you? Thanks Kayla, I am REALLY excited about it! I only distributed the first leaflets today and already have five children interested! There’s a lot of congratulations in this post – congrats to son No 1 and to you for your new venture! It will be great to hear about it all 🙂 I LOVE son No 3’s face in the second photo! !